The holidays are the perfect time to add to your catering menu to attract family parties, workplace get-togethers, and more to your restaurant business. Everyone wants to have a fun party, but most don’t want to have to worry about preparing enough food to feed all of his or her guests. It’s enough of a worry to plan an awesome party for most, and you can use this opportunity to introduce them to your restaurant’s menu. One easy to add portion of the menu that works great for holidays are the desserts. Some people may just have you cater a number of dessert trays. What holiday desserts should you add to your online menu for holiday catering? The traditional cookie tray can feature everybody’s favorite cookies. Snickerdoodles, chocolate chip, oatmeal raisin, sugar, peanut butter, gingerbread, and macadamia nuts. You can even create a gingerbread house or other dessert treat that can work as a centerpiece in the tray. These traditional trays of cookies can be customized for the party, such as a school not wanting any products with nuts in them. The vital part of selling these platters with your catering menu is that these are a safe bet that people will feel comfortable buying a catering platter of something they know their guests will love. The Italian cookie tray is a favorite among many. There are a wide variety of types of cookies that can be added for an impressive spread. The butter cookies, finger cookies, pignoli, Linzer tarts, biscottis, cannolis, spritz cookies, and rainbow almond cookies are all delicate treats that will please the crowd. You could even arrange the cookies around a tiramisu or cassata cake to add to the platter. The beautiful thing about this type of cookie platter is that it offers treats that are a little more out of the ordinary for most people than a traditional platter of cookies. You can create a fabulous tray of French cuisine desserts that are sure to please any palate. Some ideas to add to this tray would be creme brulee, fruit and chocolate crepes, tarts, eclairs, puff pastries, macarons, mousse, souffle, angel wings, and Pain au chocolat. This is a great addition if wine and cheese are being served along with other menu choices. French cuisine can add just the right amount of chic feeling to the menu. The much maligned holiday fruitcake is often an inedible mess because it’s been prepared in a commercial kitchen with too many processed ingredients. Fresh fruitcake can be an eye-opening experience. There are some fun twists that can be added to this recipe to make it appeal more to modern consumers. For instance, fruitcake cookies can be soft and chewy while offering an honest excuse you’re being health with the fresh fruit added. Another option is stollen, which is a German treat that is a fruit-cake like bread that is synonymous with the holidays. A fudge platter can be another great draw that’s traditional. People love getting to indulge during the holidays, and fudge is a good choice. You could stick with just a traditional chocolate fudge or make your tray a variety plate with peanut butter, maple, chocolate with nuts, and more. Another traditional dessert, cheesecake is another winner. This can be a great addition to your catering menu, especially if you think outside of the box. You don’t have to do the traditional strawberry covered cheesecake, but you can use one of the many iterations of this recipe. Mini cheesecakes that their guests will love is one option. Cheesecake pops is another that is perfect for party planners. They are easy for the guests to enjoy since they are a dessert on a stick, and you can offer dipping sauces for them, such as hot fudge, strawberry, and chocolate syrup. This is sure to be a hit. 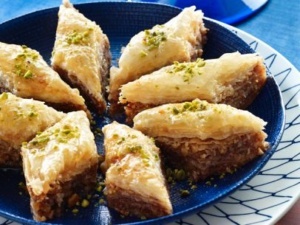 Baklava is a sweet dessert that your clients may not know how to spell correctly, but are sure to enjoy when it tickles their taste buds. The thin sheets of filo dough filled with honey and chopped nuts is an exotic delight that can be made in trays that work great for catering. Adorable marzipan treats can be the highlight of the party and are often shaped into cute little figures like fruit or pigs. These treats are almond meal mixed with honey or another sweetener. You can also add a glaze of marzipan to some of the other treats on this list like the holiday stollen or other Christmas cakes. This simple treat is sure to delight guests. The holidays are one of the biggest revenue sources for your restaurant’s catering business, and you can add to that with some delicious treats. Your customers will love being able to provide their party guests with tasty holiday desserts and are sure to come back for more when their next party comes up. Seize the day with an over the top amazing dessert.